Zac is probably the messiest and least organised person that I know. Many parents of 11 year olds would doubtless say the same thing, but if you ask Zac to move a pair of socks from off the floor and into his sock draw, there is a 95% chance that the socks will end up either on a different part of the floor, or in the wash basket even though they are unworn. In addition, he constantly loses stuff, he has no idea what time any events at school start, and most days he doesn’t know what day it is. Surprisingly, last Saturday he was scheduled to come with me to cricket at Buxton. He would have been there all day, but when I came home from dropping Sally off for her excursion (more of that later), he announced that he was off to the park. I told him he couldn’t as he was off to Buxton, but he had that covered. “I’m going to Lewis’s later,” he said. “Do his parents know?” “Yes”. So I called Lewis’s dad who was clearly unaware of the arrangements. However, he quite enjoys having Zac round so that was that. Until, five minutes later, Zac appeared with a plastic bag full of football kit. “Can you drop this off at Lewis’s? I am staying over tonight and going to the football tournament tomorrow.” Another phone call, same result. John knew nothing of the arrangement, but again he didn’t mind. “Have you got everything?” “Yes” “What about your toothbrush?” “I just need to get that” “And your inhaler?” “Its in my bag” “Are you sure?” “It will be when I get it from my bedroom” “And your brown inhaler?” “I’ll get that when I get my blue inhaler”. Eventually he went off with full bag and we didn’t see him until the next morning. Three days later the bag is still not unpacked. Sapphire is getting increasingly aggressive towards Bobby. I’m sure he just wants to play, but the consequences will indeed be dire. He is definitely going for the snip next week to calm him down. So, the excursion was a train ride on board the Northern Belle from Derby to York, and Sally and Helen were very excited about the prospect. It was a thoroughly enjoyable day, but Helen admitted to eating all of her own food as well as much of Sally’s. “Its not my fault, its Prada Willy syndrome,” she said, at which point the rest of us looked in disbelief. She explained that it is as a result of never feeling full, therefore you just have to eat. When I was at school this was called “gluttony”, and I wonder how many other syndromes are just a lazy excuse to be able to get away with one of the Seven Deadly Sins? I told you Zac was disorganised! On Monday morning he couldn’t find his Pirates Of The Curry Bean script for school. Super mum came to the rescue and found it buried in a corner of his bedroom. Then he couldn’t find his headband. Once again Super Mum came to the rescue – this time it was in the office. There is only one explanation for this – she must share the same messy tendencies as he has, to be able to find the stuff that he misplaces. Tuesday was something of an eye opener for Zac, or maybe for the rest of us. It was his taster day at Chapel High School, and he set off for the bus at approximately 8am. At 8.05 he was back. “Mum, can you take me to school?” Mum was concerned. “Did you miss the bus?” “No” “Were there kids bullying you at the bus stop?” “No” “Well why didn’t you get the bus?” “There were too many people at the bus stop”. So, was it the intimidation? Well, Mrs Cadman was concerned, so much so that she got Jan to call to see if he was ok. Simon from the Drum recognised him and asked me later where he was going, and Elliot, our tech guy and year 10 at Chapel also wondered why he was heading in the wrong direction. The good thing is that he is instantly recognisable, and his movements will be traced meticulously. My thoughts are that it is yet another thing that he has in common with his mum. She doesn’t do public transport either, preferring her silver chariot to mixing with the hoi polloi. Like mother like son! Things move fast in the IT Consultancy world. I wasn’t really looking for a new role, but an ex boss of mine called me on Monday and asked me if I was available. Technically I was, so he arranged for me to meet his new employer in Nottingham on Tuesday morning. An hour later I had a new position, starting next Monday until October. The cycling will suffer, although there will be work from home, and their office is right on a picturesque cycle path. So I can download my own permit and sign it – but who will check it? I shall carry it with me at all times and look forward to the day that I am challenged. The Raven is intensifying as the first performance looms on Sunday. We did a tech rehearsal yesterday and it went quite well, but that is the last chance we will get to use the venue before we are live! We have a costume and make up session tomorrow, and a full costume and makeup session before the show on Sunday, so we may get just one more run through, Squeaky bum time! Last night saw the Fringe launch party, and we sent two Nosferatus to preview the show. It was something of an ordeal for our youngsters to perform in front of a full adult audience – but they did fine. Really looking forward to the opening show on Sunday! 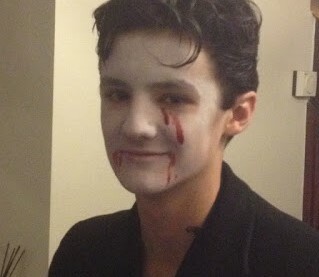 I think he has a look of Dave Vanian!